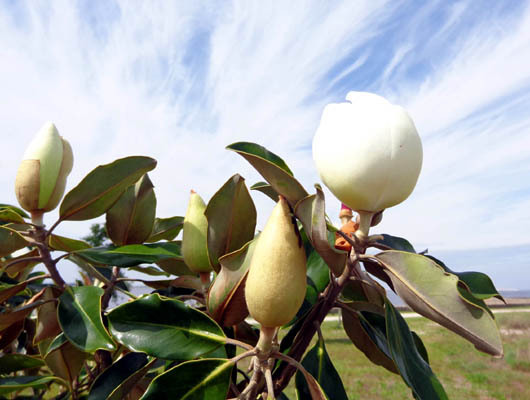 "NAS Pensacola was the first Naval Air Station commissioned by the U.S. Navy in 1914.
and Neil Armstrong, who became the first man to set foot on the moon in 1969." 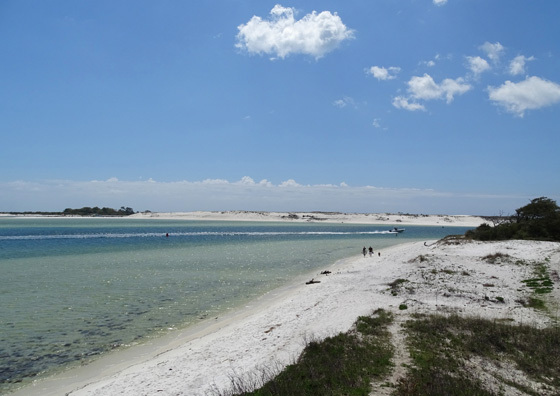 During the five weeks in March and April that we stayed at Battleship Row RV Park at the Blue Angel Naval Recreation Area we made frequent trips to this base, located about ten miles away in southwestern Pensacola, FL. 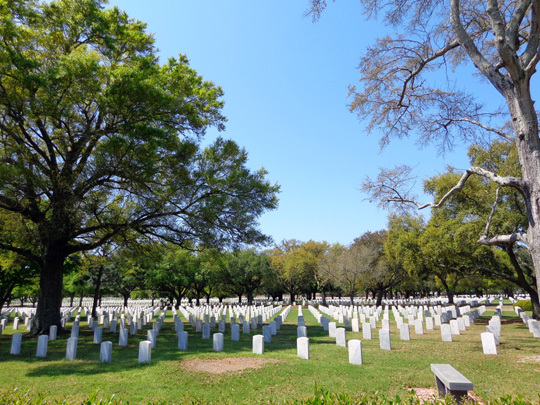 There's a lot for military retirees to like about NAS Pensacola. 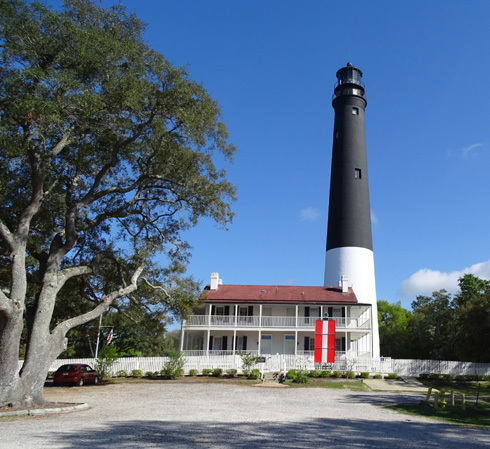 Civilians often come on base, too, to enjoy the very popular National Naval Aviation Museum, Pensacola Lighthouse, and Fort Barrancas, part of the Gulf Shores National Monument, and to watch the Blue Angels precision aerial team practice on Tuesdays and Wednesdays in the spring. In addition to those attractions, Jim's favorite place to put in long training miles was on base. Sometimes he simply rode from the rec. area to the base, then chose from dozens of miles of paved roadways on base to ride before heading home. Believe me, he covered every mile on base where he was allowed to ride. I enjoyed riding there, too, but didn't go nearly as often. We found several good vantage points to watch the Blue Angels practice where we didn't have to deal with thousands of visitors at the standard viewing place next to the museum. 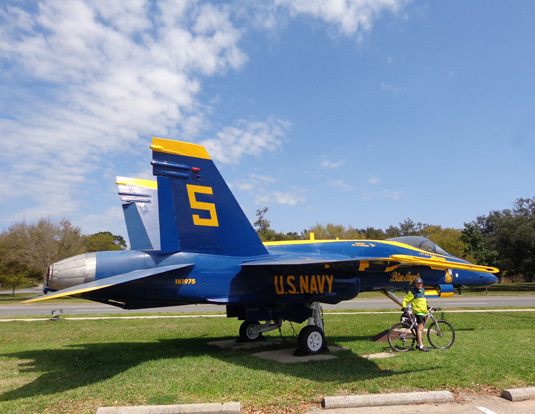 Jim poses by an old Blue Angels plane on display along the bike path; F-18s are used now. 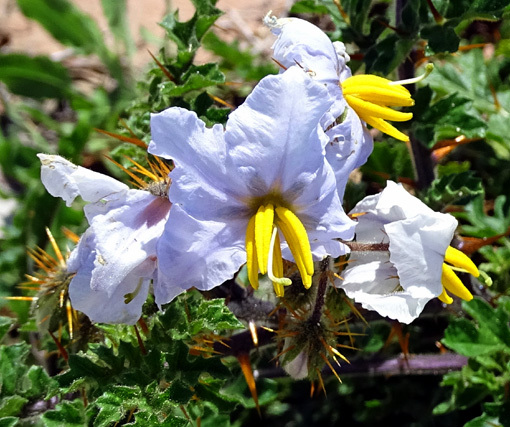 In this two-page entry I'll show photos from all over the base and include the topics in the heading. I'll have separate entries for the air museum and forts. Let's start with the two campgrounds on base . 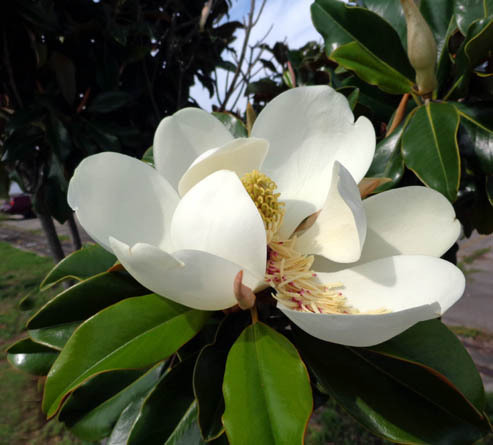 . .
We seriously considered staying here in March and April but heard more things from other retirees that interested us about the Blue Angel Naval Rec. 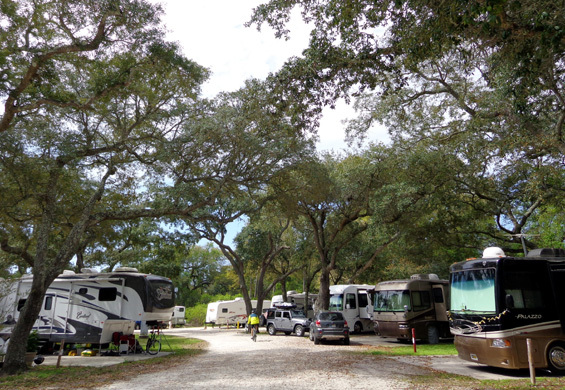 Area's Battleship Row RV park. 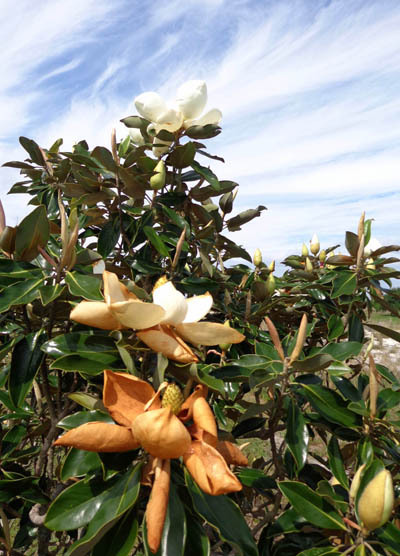 We're glad we chose the location off-base because it was quieter, less expensive, the sites were larger, and we had many more miles of sandy trails to hike and walk the dogs. 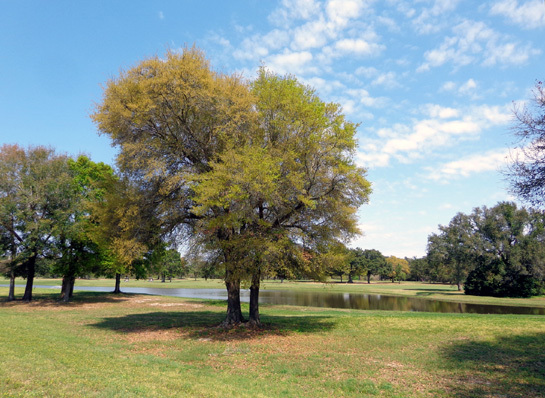 RVers who enjoy being in the middle of everything, who like organized campground activities, and who don't mind more crowded conditions might prefer Oak Grove. It's popular enough in the winter and spring that reservations are recommended for the 51 full hookup sites. There is an overflow area on base several miles away at Jackson Court. 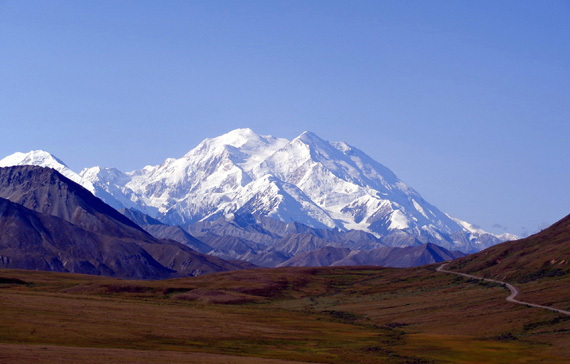 We liked the looks of that place better because the sites are larger and more isolated. (I don't have any photos of Jackson Court). 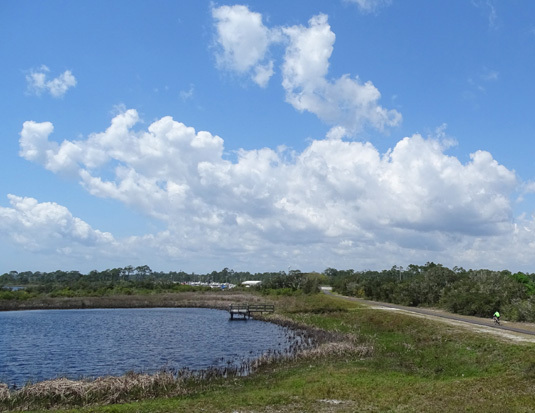 The campground's entrance is within sight of the air museum, where civilian visitors are directed to park and watch the practices near the flight line. The views aren't quite as good as those from the flight line but at Oak Grove we didn't have to deal with the crowd and we saw plenty from that spot. 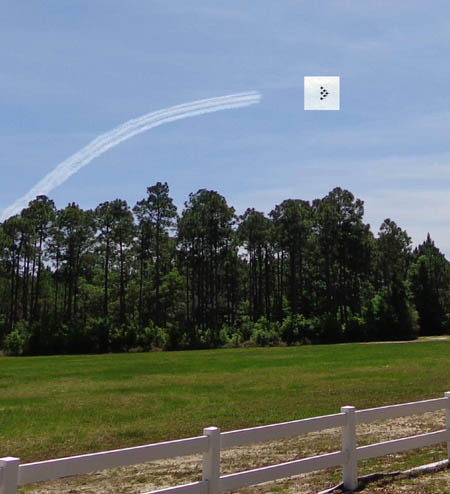 I even got some pictures of colored Blue Angel "smoke trails" from open places at the recreation area ten miles away a couple of times. Who doesn't love a photogenic historic lighthouse? 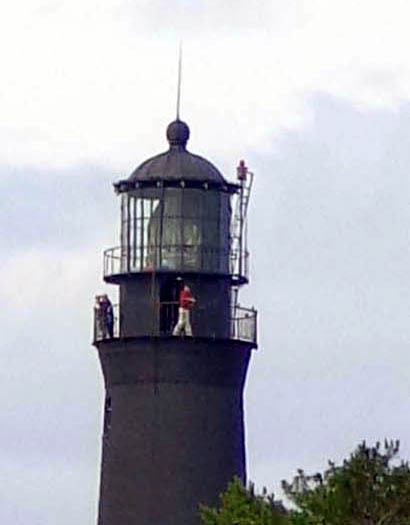 The Pensacola Light, as it's called, is located close to the air museum and campground on base. 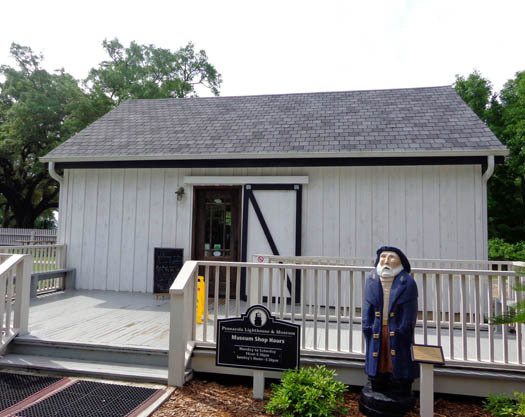 Built in 1859, it houses a museum and gift shop in the former keeper's quarters. 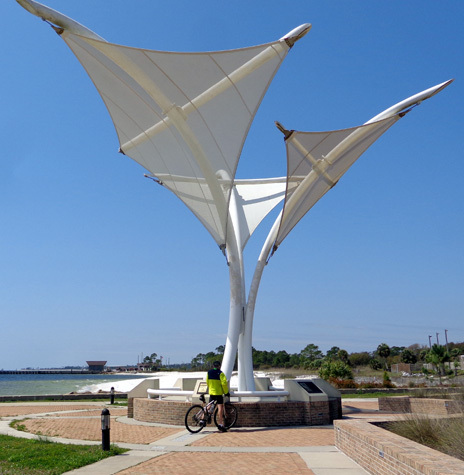 For a small fee visitors can climb 177 steps to the top of the tower to enjoy views of the Navy Yard, Pensacola Bay, the Gulf of Mexico, three old forts, and the city of Pensacola. The tower catwalk is also reputed to be the very best place to observe the Blue Angels' practice sessions. We had reservations, which aren't easy to get, on April 29 to watch the practice but ended up leaving the area the day before. We weren't able to change our date but did get a refund. Unfortunately, we never did take time to tour the museum or go up in the tower. That's on my list for the next time we're here. 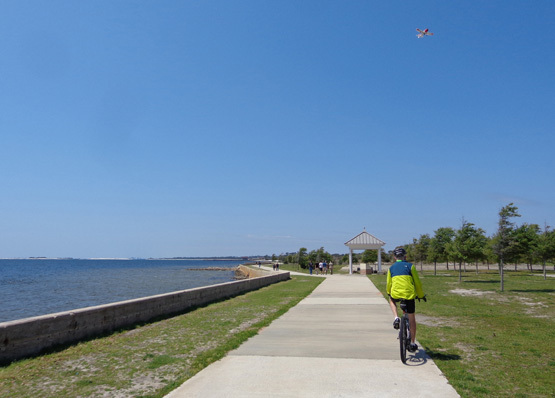 Jim rides along the paved path by the bay. Jim checks out the sculptural tribute to the Blue Angels along the waterfront. Jim rides by a pretty pond. Since so many civilian visitors are allowed on this base I'm guessing runners, walkers, and cyclists can use the bike trails and roads where there aren't signs or gates preventing their entry. We always carried our military IDs but no one ever questioned our presence. 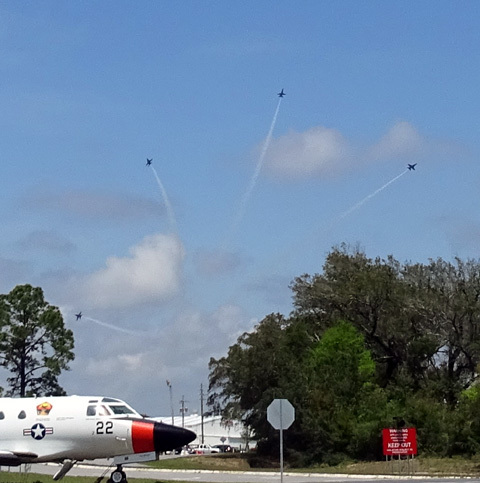 In the spring, when the Blue Angels precision demonstration team does its practice sessions on Tuesday and Wednesday mornings at NAS Pensacola, visitors are allowed to watch for free. 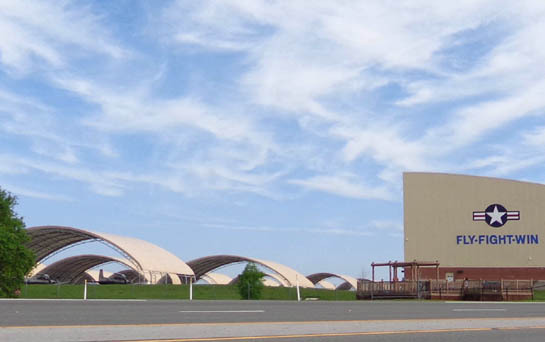 Civilians are directed to park at the naval air museum and walk to a safe place near the flight line to watch the approximate 90-minute practice. Jim and I were usually on our bikes when we watched the practices and we chose various other, un-crowded vantage points around the base to observe the aerobatics. 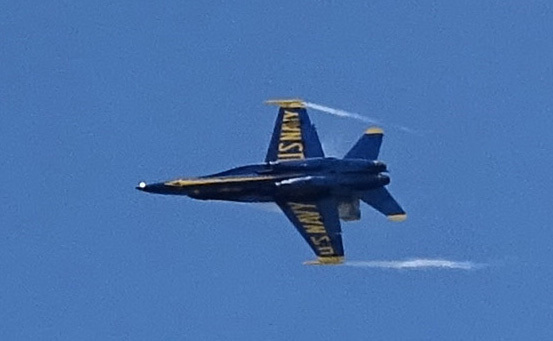 The six F-18s are highlighted; their decorative "smoke" trail follows. 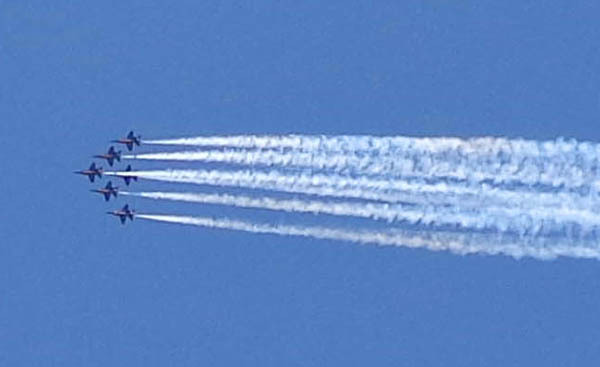 I believe this is the first time we've seen the Blue Angels in action live. We've seen the Air Force Thunderbirds in shows at several bases, including Ellsworth in South Dakota, Elmendorf in Alaska, and the USAF Academy in Colorado Springs. To me, the formations and smoke designs look similar. So are the goals of both of these elite groups of aviators and their teams -- to proudly demonstrate America's military technology, strength, and skills, and to encourage youngsters to dream of serving our country. I get patriotic goose bumps every time I see them fly. 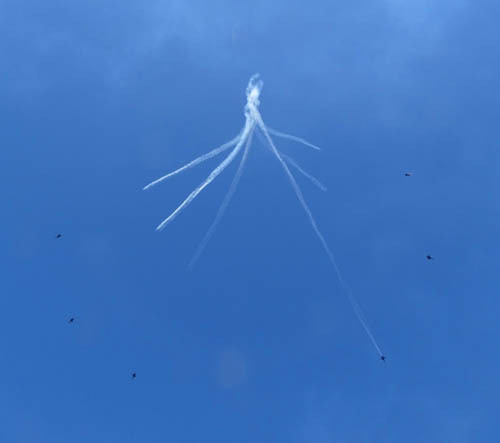 The six black "dots" are the Blue Angels' F-18s after they left a smoke pattern in the sky. Even without a tripod, with 50-100x zoom I could get some cool close-ups of the jets. During practice sessions the Blue Angels flew a total of six F-18s, like the Thunderbirds. Four usually performed their maneuvers together from the beginning of the 90-minute sessions. Two other teammates did other maneuvers until about halfway through the practice, when they joined the four. We did a lot of head-cranking to keep track of all of them. If the maneuvers weren't perfect on the first day of practice, the pilots tried to correct them the second day for that weekend's next show somewhere around the country. During the five weeks we were in the area the practice sessions were cancelled only once for inclement weather. That week they just delayed the practices by a day. 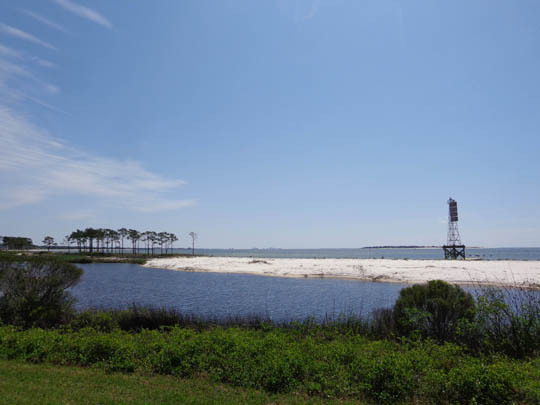 If you're ever in the Pensacola area on a spring day when the team is practicing (check their website for dates and times), we recommend you visit the base to watch them. And be sure to go to the air museum, too. It's all free and you just need a driver's license and clean record to get on base.